Flights out of Tokyo airports heading to the US and Canada depart during all hours of the day and evening. Organized tours normally offer travelers free time without any scheduled sightseeing, often dropping them off near the Narita airport. 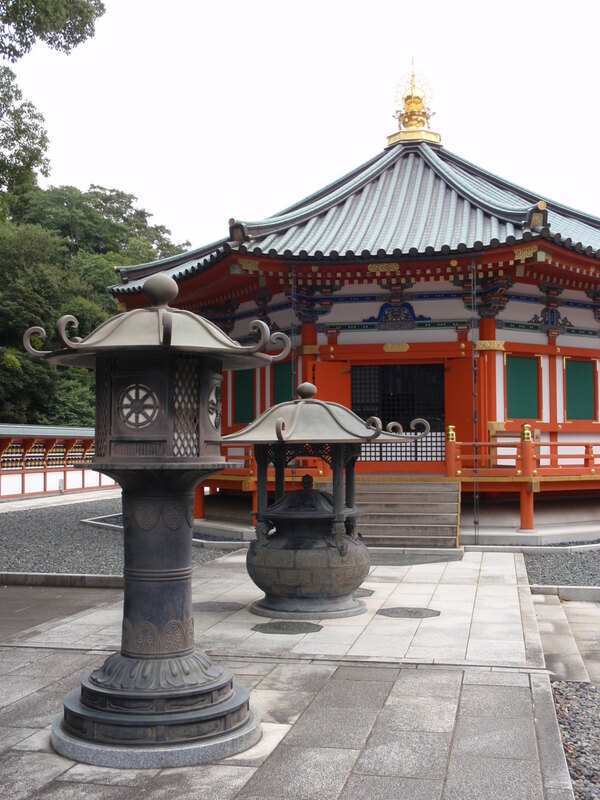 Hidden within this unscheduled time is the potential to enjoy authentic experiences and discover an amazing local treasure near one of Tokyo’s main airports: Narita City and the NaritaSan temple. 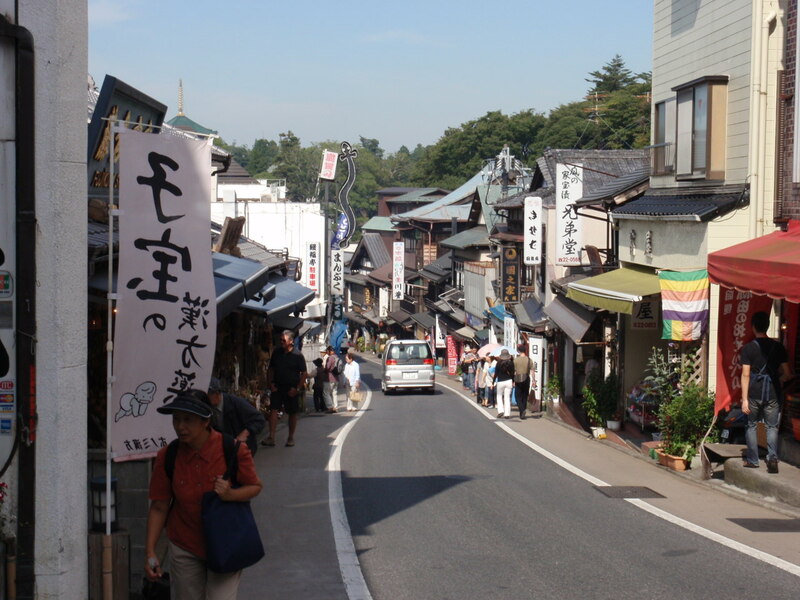 Narita city offers meandering streets to discover with local restaurants, shops, and parks to enjoy. This is made all the more amazing due to the fact that as travelers we don’t expect any sights or attractions in what we often misperceived as an “airport town”. Make no mistake, however; Narita city has a historic, centuries-old heritage present long before the airport was even a twinkle in anyone’s eyes, and a day trip or overnight in Narita will pleasantly surprise you. 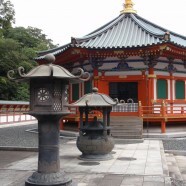 When planning a visit to Tokyo and transits through Narita, plan on one or two extra nights to allow for exploring the local Japanese culture in the small communities surrounding Narita and Chiba prefecture… you’ll be glad you did. 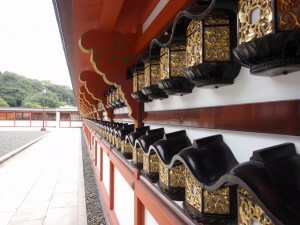 Narita-San Shinjoji temple is the town’s crown jewel. Worshipers travel from all over the region to this cultural heritage temple during Buddhist holidays. One can easily spend half a day walking the temple grounds, exploring winding paths, ponds, and pagodas. When approached from the street, the temple seems small at first as you enter through a typical Buddhist gate. Nearby stalls bear curious talismans. The illusion of diminished size continues over several terraced levels that climb up the hillside, but gradually fades as the mind begins to piece the levels all together and the temples size becomes evident. Markers dot the hillside to commemorate those who have contributed to the temple’s wellbeing. 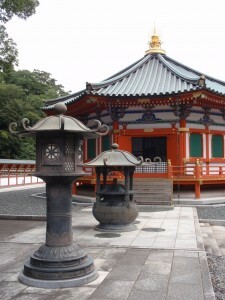 The grounds open when you crest the hill, where a large incense burner stands directly in front of the landing, dousing all with its cleansing smoke. 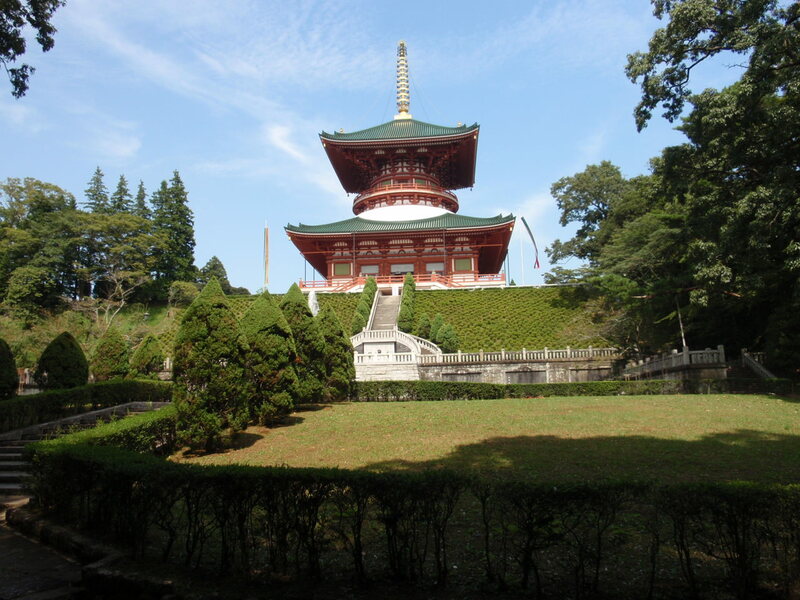 Behind it, the gargantuan Daihondo pavilion building serves as the main worship and meditation hall. To the right of the main hall lies the Sanjunoto, a three tiered pagoda, undoubtedly one of the most intricately painted structures in the world. Several benches are available for resting or meditation. If time allows, take the hike up behind the main tier and discover small creeks that meander through dense foliage and converge at a lake in the rear of the grounds. Follow the shoreline, tracing a path that heads back into the woods, past a smaller temple, to finish the circuit. 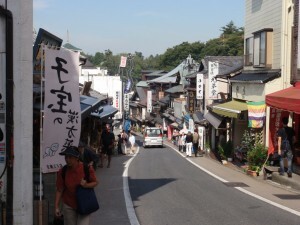 Restaurants and shops dot Omote-sando, the main street bisecting town and connecting Naritasan temple and the JR train station in a curving ‘S’ around the hill. Cuisine ranges from traditional and westernized Japanese, to the “peel your own freshly grilled eel” category that the town is known for. 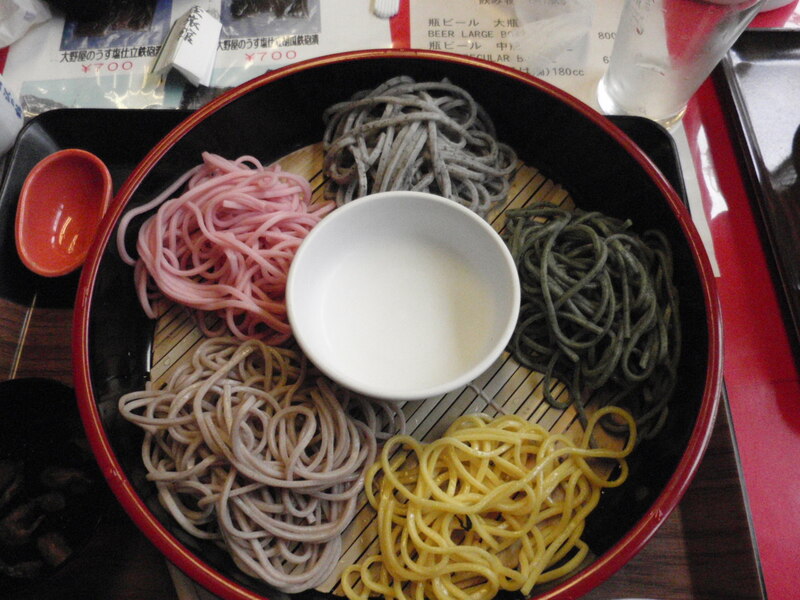 Also available in stores are home-made Senbei rice crackers, and Yokan sweet bean jellies in more flavors than you can count; most are unique to one store or a handful so if you taste something you like, it’s best to buy more on the spot. Hidden in plain sight is the modest Onoya Ryokan, restaurant and shop. Though the top sleeping floors of this landmark have long been closed, the building reeks of history and authenticity. A pleasant smile and gracious invitation from the restaurateur adds a persuasive bonus. The specialty of the house is a five-flavored soba noodle combo featuring regional cold soba noodles made with various ingredients such as spinach, beets, or squash. To mollify any sweet tooth, consider macha (green tea) ice cream, readily available in many of the stores nearby. Ryokans offer traditional Japanese accommodations with board for very reasonable prices in Narita itself, and the adjoining towns. Nearby international-style airport hotels also offer excellent world class accommodations and can be readily booked through hotel wholesalers by calling your travel agent. Even if you’re flying home from Tokyo’s newer Haneda airport, Narita city and the NaritaSan temple are worth a day trip to explore. They offer rich culture, cuisine, heritage, and a sense of discovery off the beaten path of many mainstream tour programs. • The ‘Narita City Round Bus’, a local community bus, travels from Narita Airport to Narita City and other points of interest (adult fare of 200¥ or about $2 each way, and 500¥ or about $5 for a day pass). Trips from and to the airport on the bus are of different lengths of time as the system runs in a wide circle; trips to the airport from Naritasan Shinjoji temple take about 25 minutes, whereas trips from the closer Aeon mall take over an hour as the bus must complete a full circle before returning to the airport. • Taxi cabs are quite expensive, with a short ride, for example from Narita Hilton to Narita City, costing over 10,000¥ each way. This article was published on GTH | Gay Travel Herald on November 26th 2012.